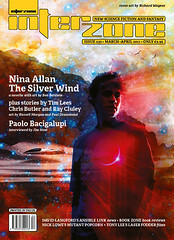 A new novella set in an Oxleas Woods of the future has recently been published as part of Interzone, a science fiction & fantasy magazine (issue 233, March-April 2011). Shooter’s Hill had a rough reputation. 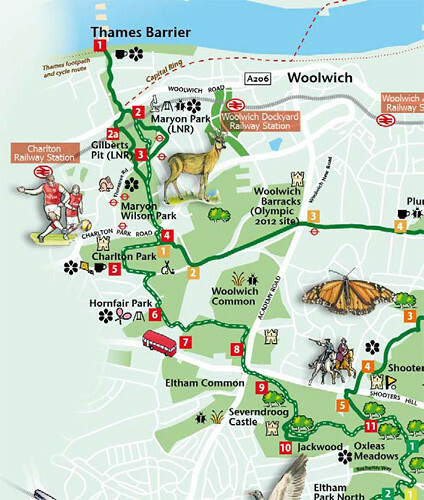 The reforestation policy had returned the place to its original state, and the tract of woodland between Blackheath and Woolwich was now as dense and extensive as it had once been in the years and centuries before the first industrial revolution. 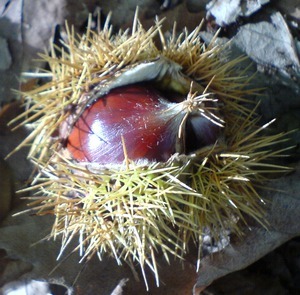 The woods were rife with carjackers and highwaymen, and scarcely a week went by without reports of some new atrocity. The situation had become so serious that there were moves in parliament to reinstate the death penalty for highway robbery as it had already been reinstated for high treason. 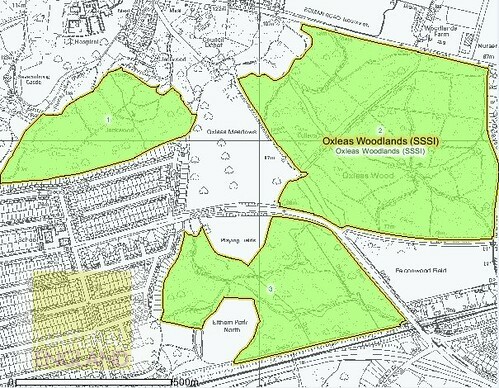 During the course of certain conversations I noticed that local people had taken to calling Oxleas Woods by its old name, the Hanging Wood, although no hangings had occurred there as yet. At least not officially. On saturday I went to Oxleas Meadow for a bit of sledding, it was madness out there! 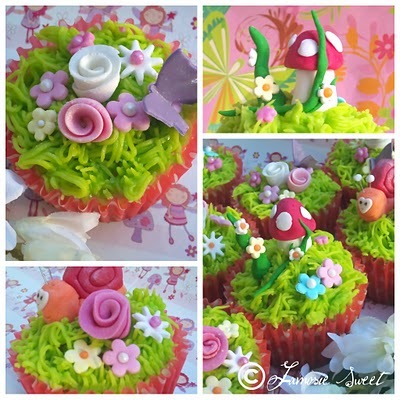 Maddest of all were the grown men, many enjoying their second, or third childhood. Some of them were even breaking with latterday gender apartheid protocol and whizzing down the slopes on pink sleds they had borrowed from little girls. Adults by no means had the monopoly on winter madness though, in fact at moments it felt like the hill had turned into an inventive mess of tea trays, lilos, car parts, plastic bags, baby baths, signs[1. photo by stumayhew. ], hub caps, dinghys, and even a kitchen worktop. 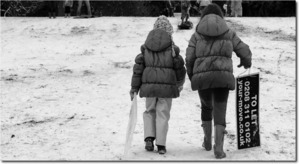 I myself had, after a search that began on the infamous snow day last february, obtained a plastic sled from ruxley manor garden centre, and spent a few minutes figuring out how to steer, or at least alert those in my path they were about the experience the ultimate sliding tackle. At last, rather than appropriating (well, cloning) pictures by other people, I’ve finally managed to use one of my own as a site header. This one is a panorama taken in september 2006 using a sony phone, which is brilliant mainly because it can make panoramas on the fly, has a torch, and has outlasted several phones that I’ve bought since – many of them exhibiting suspicious signs of inbuilt obsolescence such as falling apart when being dropped, or konking out after a sledging trip… Yes I know, that’s ridiculous, but in my defence, when the technician at the local sony repair shop wrote off my phone on grounds of water damage, I reasoned they might have been right on account of all the snow that got into my pockets, however, on closer inspection of the phone, the water marker (a little white sticker on the battery that goes red when it comes into contact with water) was as dry as the corbett estate, and furthermore, the technician’s comment that the circuit board was rusty also set alarm bells ringing as I don’t think there’s anything inside mobile phones that actually rusts. Needless to say I won’t be going back there. Anyway, this is admittedly a bad photo, I did try to do something about the join marks, mainly by changing it into black and white, but then missed the greens, so reverted back to the patchy-but-verdant look, besides greyness didn’t help much. I quite like the lense flare beaming down on the two people though. Incidentally, stumayhew one of my favourite local photographers and member of aperture, really does take good pictures, and recently had a photo featured in the guardian. It might not quite be a banksy, but the council dog stencil does seem to be fairly effective at keeping the hill clean and safe, at least in the bits it appears; I certainly would tread carefully walking across the roundabout lawns on the wimpey estate, or certain parts of eaglesfield or shrewsbury park or the woods, although things are getting better. Anyway it seems to be a fairly serious initiative with its own enforcement officials being geared up to hit anti-social dog-owners where it hurts, i.e. the purse. I’m not sure what kind of dog the stencilhound is? I once saw a similar street painting in paris, and it was definitely a lapdog of some sort, you know the type that fits in a handbag, but the Greenwich version appears to be modelled on a cross between a Poodle and an Alsation, I call it a Poosation. 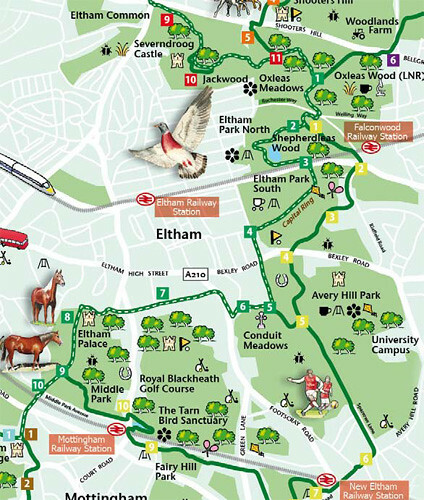 As part of the south east london Green Chain Walking Festival , a guided walk from Eltham Palace to the Thames Barrier is taking place that visits in Oxleas Woods and Severndroog Castle en route, tieing in with the Open House events there and at other stops along the way. Walk London Audio Guides have been provided for the different sections of the chain, including those that make this pathway; although they go clockwise, this particular trek is being done the other way, presumably as it involves more downhill walking, well it is seven miles long after all! The guides make for curious listening, and even feature cameo appearances from boycie. I’ve put the audio alongside the maps, which include the Green Chain in red lines, and the Capital Ring route in yellow.